Okay, I know, I’ve said it before but I have an obsession for pincushions. So, to help bring you over to my side of the line, I have surfed the web and gathered up some of the most Ah-Maz-Ing free pincushion patterns. That’s right, they are all free! From toadstools to eyeballs, I am confident that there is a pincushion pattern on this list just waiting to be added to your sewing space. Each one is super cute and the options are endless! It is really hard to pick just one. Woo Hoo! How is that for creative ideas? These pincushion patterns are fantastic and free! 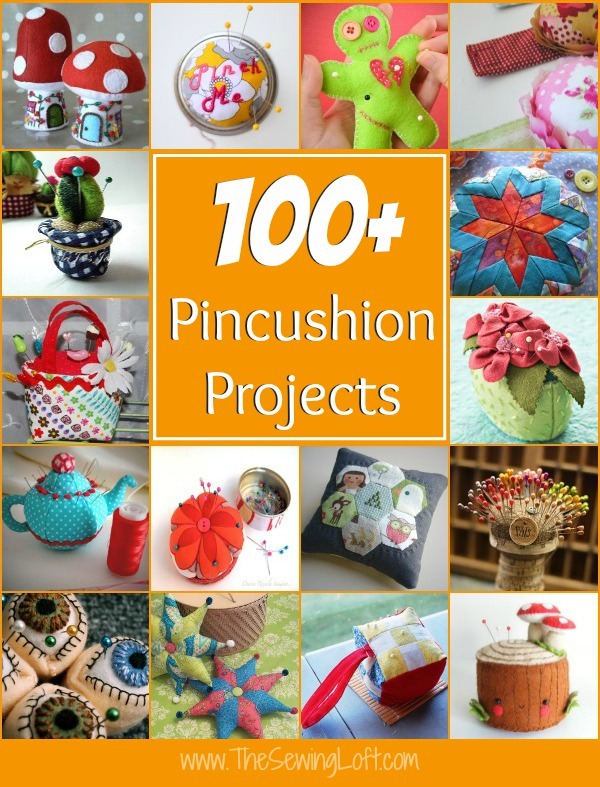 That’s right, every project on this list includes a free pincushion pattern or tutorial for you to make. So, be sure to Pin This post for easy reference. I just made my first pin cushion (a very boring rectangle), but I thought it would be fun to make some pretty ones sometime! Just pinned your post so I can try one or two in the future! Heather, You are tooooo generous! Thank you!!! So glad you like them! I would love to see pictures if anyone is making. Thank you so much for including my pretzel pincushion in this great list! I love it Abby and am happy to share! I see you have included my free strawberry pincushion pattern. I sure have Sandi. I hope you are seeing some traffic. It is super cute! Thanks so much for sharing. So many cute options–thanks for sharing! Your boat is super cute! Thanks for stopping by to say hello! Thank you so much for including my hedgehog pincushion! It’s inclusion also introduced me to your wonderful blog – I’m off to explore it now! Thanks so much Sara. There are so many fun ideas out there – I just need to find time to stitch them all up! Thank you! I love all pincushions, and these are some fabulous renditions. How awesome is that! Your pincushion is super cute Connie and I’m so happy to hear that you are seeing some traffic from it. Yay!! The first pattern and the second pattern are the same. I wanted to make the kitty lat pincushion but did not see the pattern pieces or templates mentioned in the first sentence of the instructions. You can click on any pincushion title and a new window will open with the tutorial/pattern. How can a person purchase this book ? There is no book to purchase. Each pattern is made by a different designer. I am looking for a cell phone embroidery pincushion pattern. Do you know where I can find it? I am looking for a pin cushion made from denim and looks like overalls.Any ideas? Thanks for your note Gerlinde. There are so many patterns on this list but I do not recall one made with denim overalls. Perhaps you will be interested in one of the other designs.